There's been speculation ever since the Zillow / Trulia merger about what would happen to Active Rain - the popular real estate social platform and networking forum. Today, the news broke that it's being acquired by The Ben Kinney family of companies. The Ben Kinney group also owns several other real estate brands, including Real Launch, Brivity and Blossor. So far, the initial response on Active Rain has been overwhemingly positive. Q. When will all of this take place? As the press release states, the sale is expected to close on June 30. Q. Anything I should be aware of between now and June 30th? To prepare for the June 30th date, late in the evening on Monday, June 22nd, ActiveRain will be moving away from the activerain.trulia.com subdomain to live independently on www.activerain.com. We anticipate no issues relating to links, content and SEO. From June 23-30, we’ll have a few periods of downtime on the site as our engineers move all of the technology over to its future new home. We’ll do our best to alert members to any outages. No other changes are anticipated before the actual June 30th transition. Q. Tell me more about the domain shift: why the change? Moving off of the Trulia domain will occur as obviously Trulia (now part of Zillow Group) will no longer have an ownership stake in ActiveRain. Current and future leadership of ActiveRain have been working together to make sure there is no impact to members. In the past year, ActiveRain has made many SEO enhancements to help Google crawl the site and discover member content. In addition, there will be automatic redirects set up to make sure your ActiveRain links continue to work as expected. Q. During this transition period before Ben’s group takes over, will there be any changes to billing or technical support? There is no change to billing or customer/technical support during the transition period. In fact, there are no changes to any products or services. We are all here keeping things humming along. Learn more about Ben Kinney on LinkedIn or on his website, www.benkinney.com. 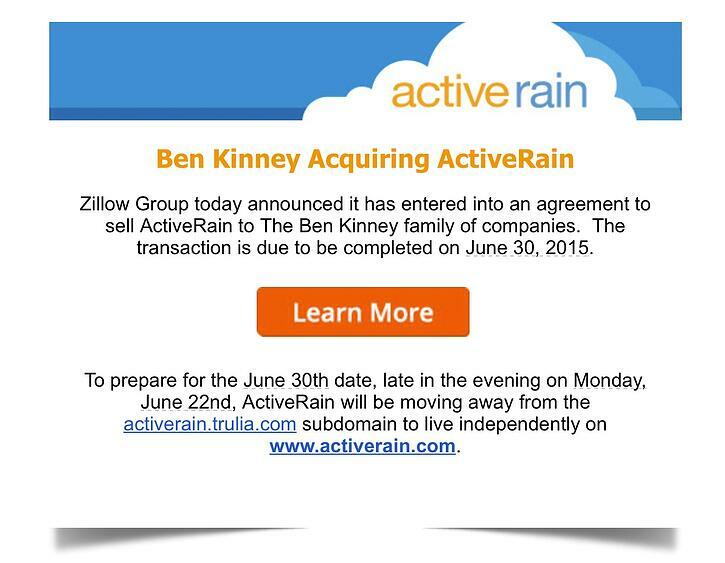 You can also read his Active Rain blog post about the acquisition. What are your thoughts on the acquisition? Any benefits or concerns? Share in the comments.